Welcome, fellow Tastespotting.com members! I hope you'll add me to your blogroll or Google reader and come back often!!! Thanks for stopping by my blog today! Forget cardboard-y rice cakes or sawdusty, boring crackers. Meet my newest snacking obsession--a peanut butter, banana & honey mixture taken to new heights by the addition of some sprinked cinnamon! It's one of the recipes in my friend Samantha Heller's new book, which just hit bookstores last weekend! I bought a copy at her recent talk and book signing, and of course, being a foodie, I jumped right to the recipe section. This one jumped out at me as I had everything already on hand (Recession Recipe qualification!) and I love peanut butter! 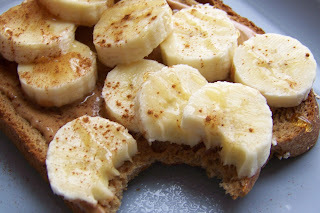 I was so surprised at how much of a difference the cinnamon makes in this sandwich---and it's healthy, too! Naturally, you shouldn't glob on half a cup of peanut butter, so be reasonable, peeps. I spread a thin layer of Trader Joe's all-natural peanut butter on a slice of Trader Joe's high-fiber whole wheat bread. 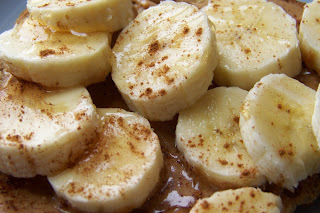 I squeezed the thinnest drizzle of honey on top, and sprinkled the cinnamon all over. One bite and I was a devotee. The crunch of the toast, the sweetness of the bananas, and the stick-to-your-ribs-goodness of the peanut butter make this a snack that makes your taste buds happy. And did I mention the awesomeness of the cinnamon?? This is my go-to snack--I made it three times last week! What I always appreciate about Samantha is that, while a registered dietitian, she's not at all judgy. She has a reasonable, do-able approach to food. Don't just eat healthy because you want to lose weight--do it because you only get one body, one brain, and one go around this crazy thing called life. Take good care of your body and your brain and they will return the favor! Seriously..this snack is crazy good. I think I'm going to make another one right now (I know, I know, moderation in all things!) I'll definitely post more of her recipes as soon as I try them. Happy Snacking! I also recently discovered this flavor combination and promptly became addicted. 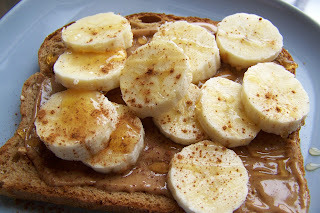 I also recommend whole wheat toast or english muffins, peanut butter, sliced apples (I used Gala) and a dusting of cinnamon on top. The crunch of the apples makes it so satisfying to eat. I made this earlier today and it is ORGASMIC. I LOVED EVERY BITE OF IT!! Oh my favourite! I love this!